By far the most common complaint I've heard about Pokémon Black and White 2 is the fact that Black 2 and White 2 were released on last generation's Nintendo DS even though the Nintendo 3DS has been on the market since last year. Frankly, I find this a complaint with little to no merit. Here's why. Pokémon Black 2 and White 2 look good on the DS—as did the original Black and White before them. While there's no doubt that the 3DS could have made Black 2 and White 2 look even better, graphical quality has always been secondary to art style in the Pokémon titles. The series could have moved away from its sprite-based roots and into the world of countless polygons long ago if the creators had wanted. 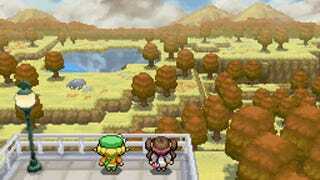 Instead, Pokémon today looks much as it always has—from character sprites, to buildings, to battles. And when a 3DS Pokémon game is eventually released, I wouldn't be surprised if it still looks basically the same, just layered on a 3D plane. For the last three generations of Pokémon titles, it has taken about four years to make a completely new game. Making a remake—or in this case a direct sequel—where half the work is already done cuts the development time dramatically. And since they didn't even have to remaster each and every sprite in Black 2 and White 2 and port them to the 3DS, it took only a year-and-a-half to make this game. Of course, if you allocate fewer graphic designers to a project and have a development cycle of less than half the time of a next generation Pokémon game, it's obviously going to cost less to make. This in turn raises the amount of profit when the game goes to market. Moreover, a sequel gives game designers the chance to add in cut content from the original game as well as fine-tune the game experience based on user feedback. It's both a financial and creative victory. Besides the business issues above, it's important to remember one simple fact: The Nintendo DS is the most popular system of its generation in the world with over 152 million units sold. The 3DS, on the other hand, has only sold 18 million units so far. You want to play Black 2 and White 2 and Nintendo wants you to play Black 2 and White 2. So Nintendo put it on the system that you, as a Pokémon fan, are pretty much guaranteed to have. There is nothing wrong with Black 2 and White 2 being on the DS instead of on the 3DS. Pokémon has an art style where graphical hardware advancements mean little; and by being able to reuse Black and White's assets, we get a new Pokémon game only a year-and-a-half after the last one. Moreover, the company making the game gets more out of its initial investment and the game designers get to include their favorite ideas that just didn't make it into the original Black and White. In short, everyone wins—especially you. Pokémon White Version 2 and Pokémon Black Version 2 were released on June 23, 2012, in Japan and will be released in North America on October 7, 2012 (October 12 for PAL).